Affecting all ages, gum disease is silent, sneaking up on you while slowly damaging your gums, teeth and the bone in your jaw. Many people are unaware gum disease is present until it has reached an advanced stage. 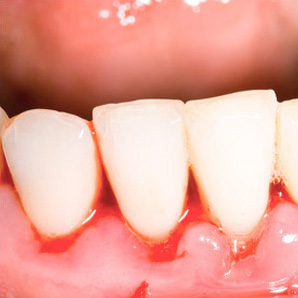 Bleeding gums are the most common symptoms of periodontal disease. If you’ve noticed the signs and symptoms of gum disease, it’s important to get it treated – the sooner the better. We can offer you a wide variety of effective gum disease treatments. To preserve the health of your gum tissue, the first step is to remove the bacteria and calculus (tartar) that has built up on your teeth because that’s what’s causing the infection. Next, the gaps or “pockets” that have formed at the base of your teeth are cleaned and treated with laser disinfection. We may also prescribe an anti-bacterial mouthwash for you to use to use at home. We also uses lasers to treat gum disease. The laser’s high-energy light beam removes diseased gum tissue in a virtually painless way and acts as a sterilizer along the way. With laser treatment, bleeding is reduced, swelling minimized and recovery time is much quicker. As an added bonus, because they are silent, there is less stress and anxiety for you. Due to the non-invasive nature of lasers, your mouth begins to heal immediately after your treatment. Your bone or gum tissues have been destroyed, we use grafting to encourage regrowth.